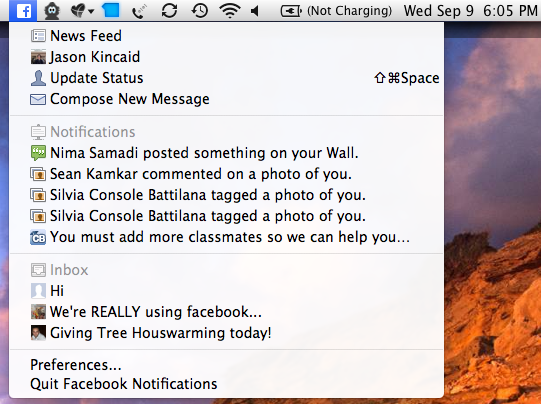 Finally, a Facebook Notifier for Mac! I have long been a fan of Google Notifier for Mac, which sits in the menubar and notifies you if you get any incoming mail. Naturally I was excited to hear about Facebook Desktop Notifications, a new app that basically does the same thing but for Facebook. 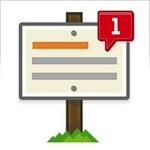 With this Facebook Notifier, items posted to your wall and messages sent directly to you will be published by Growl notifications to your Mac desktop. For me, Facebook can be a huge distraction and time waster, anytime I log into the site it’s easy to let 30 minutes pass just keeping up to date with all your friends statuses and picture uploads. Facebook Desktop Notifications cuts down on this wasted time by notifying me of incoming messages and notifications, so basically I can waste less time on the actual site by logging into it less often! Anything that helps me stay in touch and be more productive is a win-win in my book, so I’m pleased to have the Desktop Notification app installed. The app is beta but so far seems promising and I haven’t had any problems with it, you can download it from Facebook if you are interested. Above image from TechCrunch, where I also learned of this little utility. There have been a few updates to the app and each one seems to be better and better.